In case you aren't aware, a food frequency questionnaire (FFQ) is the most commonly used method of tracking an individual's diet. Oftentimes decades worth of observational studies are generated from one or two FFQs administered at their starts. The problem is, whether consciously or unconsciously, we tend to forget our portions and choices and so FFQs are fraught with error. What we need is a means to track that takes forgetting (and perhaps guilt) out of the picture. Enter the "Automatic Ingestion Monitor" (AIM). The AIM is pretty simple. 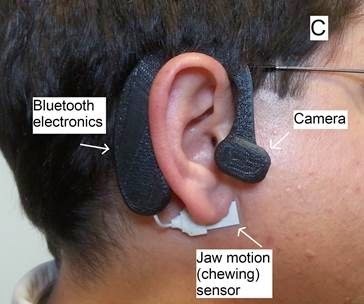 It fits over a user's ear and by means of a motion sensor and a camera, when it detects chewing, it takes photos of what a person's eating and then via Bluetooth transmits those photos to a paired device. As far as I'm concerned, validation of the AIM device can't come fast enough.